THE FREE CHOICE E-ZINE: SUNDAY FUNNIES: THE WHOLE TOOTH! For those who came in late, I am a baby dragon. That means, among other things, that the teeth I have right now are my baby teeth and that someday they will be replaced by my adult teeth. That probably won't happen for a couple of centuries yet, but despite how much money I'll get from the Tooth Fairy for this, I'm actually in no hurry to lose my baby teeth. In fact, I'm pretty attached to them as it is. Of course, I'd be doing this a whole lot more if I ever find out where "Bubblehead" (the human I let live with me, although he'll claim it's the other way around) hides his secret stash of Belgosian Dark Chocolate. He thinks I think I don't know about his secret stash of Belgosian Dark Chocolate, but I do. The problem is finding it! Unfortunately, Bubblehead has gotten real good at hiding it on me. Then again, they do say practice makes perfect, so he can thank me for that. Time for some dentistry themed jokes! A boy had his three friends come over to brush their teeth together every morning. One of them finally got around to asking, "Explain why we have to brush our teeth together?" 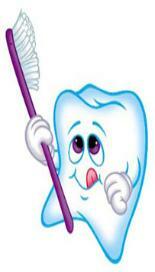 The boy replied "My dentist said that brushing alone won't prevent cavities." A doctor and a dentist was vying for the hand of the same maiden. One day, the dentist had to go to a conference for a week and gave the girl seven apples. Because everybody knows that an apple a day keeps the doctor away. Unless it's that guy in the blue police box. Then you just have to worry about when he shows up. Remember, the tartar that needs to be removed from your teeth is NOT good with seafood!